By now we all know that LED lighting is the lighting of the day and the lighting of the future. LED lighting last years and saves energy. The price of the bulbs is a great value when you consider the quality and the life of the bulb. People who still use incandescent bulbs in their homes are using the same technology used in the late 1800's when Thomas Edison filed for the U.S. patent of his light bulb. It is probably safe to assume this is the only technology from the 1800's that still plays a part in their lives. 1. LED lights in deli displays allow much less bacteria growth than displays using halogen or even fluorescent bulbs? 2. If people in the United States would change only 50% of the lights used during our holiday seasons with LED lights, it would save over $17 billion dollars in energy cost per year! 3. In 1992, Shuji Nakamura invented the blue LED light while working for Nichia Corporation. For his efforts, he was given a $200 bonus. However, Shuji Nakamura never signed a non-disclosure agreement with the company and in 2001 he sued for $189 million dollars. While Nakamura did not win $189 million dollars, he did win the largest amount of money ever awarded in a Japanese court, $8,100,200 dollars! 4. 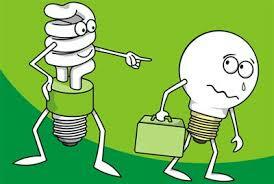 Incandescent lamps only convert 9% - 10% of their energy source into light. LED lamps convert close to 100% of the energy used into light. 5. If you ever sat on a porch with the light on, you know how bugs swarm to incandescent lights. LED lamps do not attract bugs and the numbers are significantly reduced. This is because incandescent lamps (and CFL's) produce UV light and infrared radiation which bugs love more than bees love honey. There are many sound reasons why you should consider changing to LED lights. They are good for the planet, a great investment, and they produce less waste than any lamps before them. We hope you enjoyed these fun facts. If you would like more information on changing to LED lighting, contact the experts at Lighting Services Incorporated. Lighting Services Incorporated has been industry leaders for more than 80 years and we would like to help you.